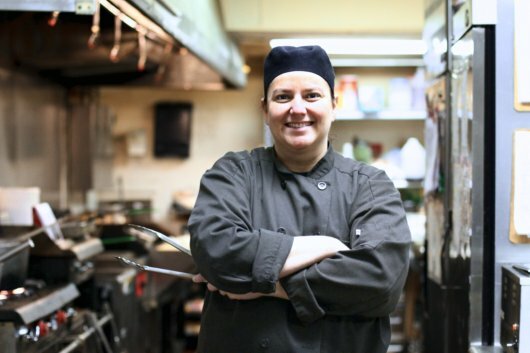 Jenn Purkey, the head chef at the General Denver Hotel in Wilmington, Ohio, stands in the kitchen of the historic restaurant and pub. Purkey and her staff have worked to make the restaurant a fixture of the local dining scene, in part by sourcing her ingredients from local farmers and food producers whenever possible. Post and photo by John Cropper of Wilmington, Ohio. Agriculture remains the biggest contributor to the regional economy in Clinton County, Ohio. This series highlights actors in the county’s local food economy, from farmers and restaurant owners to community gardeners and food pantry directors. The idea of the restaurant being used as a distribution point for food ideas seems just excellent to me. Here in Oneonta, NY we have a restaurant on the edge of our Farmer’s market which serves their time-worn specialties at all times, and meandering through the crowd at the market are a few ambitious entrepreneurs who are doing their best passing around as few trays of samples. How great for a restaurant to be able to consolidate those people, and their information, in a special Saturday opening that is devoted to providing a venue for the totality of the foods there and their relationships in local eating patterns. I love the look on Ms. Pukey’s face. I love her confidence. The photo and your essay, and the comment from Oneonta (which is my grandma’s) — despite our outward appearance, maybe most of us Americans want more than Target and IHOP. Who wouldn’t want a breakfast that changes with the local food supply?